A simple mesh back – breathable, flexible and lightweight. Perfectly adapts to executive offices and conference rooms. With it’s good natured styling and broad range design options, the Inertia family of chairs makes itself right at home no matter the job or budget. 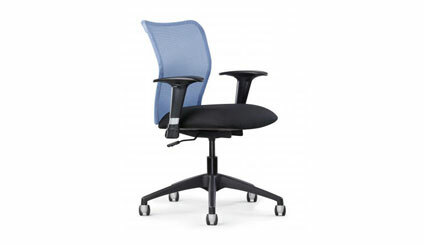 The Inertia Mesh Back Midback task executive office chair is a true multi tasker. Inertia Task comes in both High back and mid back with either fully upholstered or lightweight, breathable woven mesh back. With it’s Synchro Tilt back mechanism, Inertia Task offers affordable comfort and support all day long. I highly recommend this chair as it is an extremely comfortable sit and fits nicely into small spaces. I have put these into computer workstations, private offices, reception areas conference rooms, training rooms and even the home office. There is a broad palette of fabric and mesh options available and can be tailored to suit your tastes and budget. Don’t forget, the Inertia family of chairs from Allseating also boasts of an offering of upholstered back, there is a matching side chair and also the Inertia Bar stool works great in cafeterias and bistros as well as the home. The Inertia task mesh back comes with a 10 year bumper to bumper warranty.